Headed to an amusement park this summer? It’s a good time to plan your meals ahead so you don’t have a meltdown on your hands. And, navigating an amusement park can be easy! In fact, you may be surprised to see how many major amusement parks are well-prepared for guests with food allergies. If you’ve recently visited an amusement park, please be sure to leave us a comment and let us know how it went! Pack (or ship to your hotel) snacks and hard-to-eat-safely items like breakfast, hamburger rolls, granola bars and desserts. Bring a collapsible cooler (AND freezable cooler packs) to tote into the parks for the day. They are great at storing safe food as well as keeping epinephrine auto-injectors cool during long, hot days. ALWAYS carry two auto injectors. Everyone wants to carry as little as possible to an amusement park, but two auto-injectors MUST come with you. Consider a small backpack with a zipper so you’re not bogged down with a spillable purse or tote bag. You’re going to need sunscreen anyway…! Contact culinary services at least a week in advance to ensure you have a fun, easy and SAFE day at the park! Disney is renowned for how it accommodates guests with food allergies. They are truly the gold standard. Guests can review menus and have access to chefs to obtain further information. It is recommended that you discuss your food allergies with each server, as always. 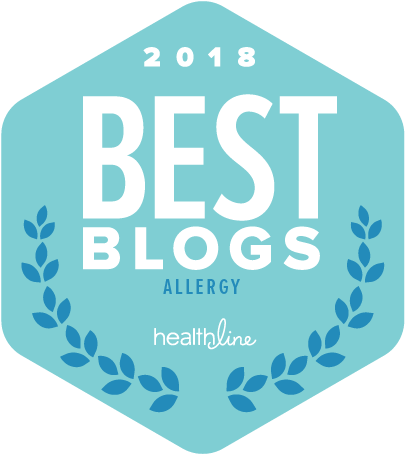 There’s lots of excellent information and suggestions online, including contacting them prior to your trip should you have 4 or more allergens and how to bring safe food into the parks. Universal Orlando recommends prepping for your trip by reviewing menus and discussing your allergies with a Guest Services advisor. Plus, they outline how to bring your own food into the park should you need to! If you’re headed to Universal Studios Hollywood, you’re in luck: you can easily view what’s safe online. Call Guest Services if you have multiple food allergies or further questions. Legoland refers guests with food allergies to a Dietary Guide that doesn’t connect at the present moment. They also suggest contacting LLF-Food@legoland.com prior to your visit to answer specific questions. Per their guidelines, outside food and drinks may be brought into the park for dietary needs. Did you know that Seaworld has designated dining facilities for visitors with food allergies? There is at least one restaurant in each of their parks that is best suited to handle food allergy issues and preparation. Click each link to read more about Seaworld’s food allergy preparations and policies. In addition to making allergen menus available at most of Hershey Park’s restaurants, dining for those with food allergies has just gotten easier with the addition of a gluten-free, nut-free, fish and shellfish-free restaurant. Hershey notes that every nursing station is equipped with EpiPens, but – as always – remember to bring your own. Sesame Place keeps its allergen information to individualized questions. They ask that guests ask specific questions to AllergenfriendlySPL@sesameplace.com at least 3-5 business days in advance for additional information. A culinary representative will work with each guest to ensure a safe dining experience. Guests with food allergies are allowed to bring in safe food. Six Flags have a variety of restaurants at each park. While you cannot see an allergen menu on their site, you may be able to get the name of food vendors and research ingredients that way (for example, Six Flags Great Adventure has a Panda Express that a visitor could research). Should you have food allergies, you can bring food inside the park. If you plan on eating at one of the parks’ restaurants, be sure to ask LOTS of questions about ingredients and prep including french fry oil and cross contamination. Busch Gardens seems to take food allergies seriously. They answers a lot of excellent questions right on their website and provide ways of obtaining even more specific information should it be needed. Busch Gardens Tampa even offers allergen friendly dining facilities. Again, collapsible coolers are allowed for those with dietary restrictions. 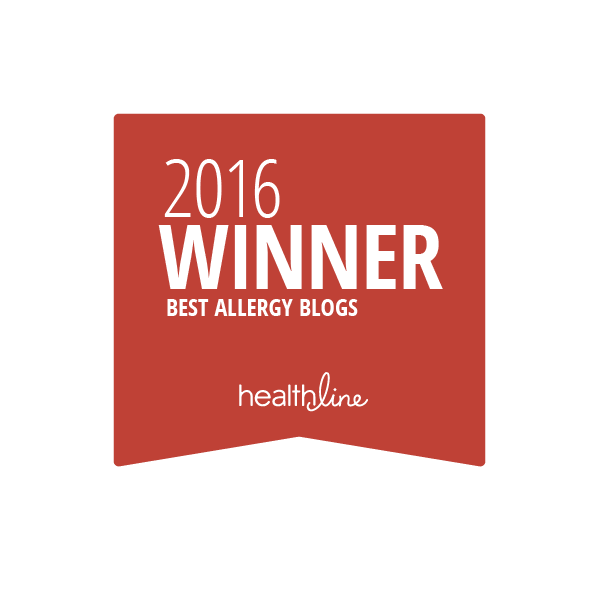 Cedar Point’s website identifies dining locations that serve certain allergens as well as a few that do not serve certain allergens. 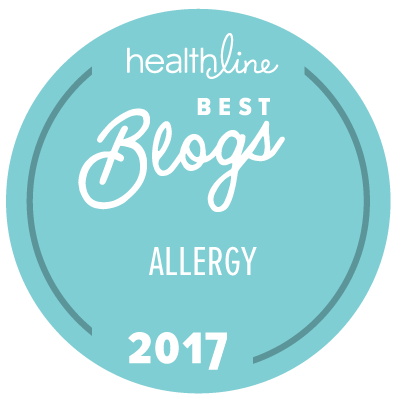 If you have multiple food allergies, this may take a little cross referencing to find a few things that are safe. They do not list information about brining in safe food from outside – so you may have to contact them directly. Knott’s Berry Farms follows the same process as Cedar Point in identifying products and locations that use allergens. They also identify certain locations and products that are free from specific allergens. Again, they do not list if you can bring in safe food from outside the park. Contact them directly should you need additional information. Once again, Canada’s Wonderland follows the same process as Cedar Point and Knott’s Berry Farm in helping guests navigate the park. They list dining options by allergen, so if you have multiple food allergies, expect to cross reference these lists. They do not state whether or not you can bring in safe food from outside of the park. Contact them directly with additional questions. I love seeing more and more stadiums adopting the peanut-free game concept. Lucky for us in DC, the Washington Nationals just released their peanut-free game schedule. Call or contact the stadium directly for ticket pricing and further information. Not a Nats fan?! (What’s wrong with you?! Just kidding.) Check your local team’s website for their own schedule of peanut-free games. Don’t forget minor league teams who are awesome about getting in on the action and making baseball fun and safe for everyone. Rejoice, Seattle fans! I just heard from the Mariners! For the past several years, we’ve been offering the opportunity for fans with peanut allergies to come to games at Safeco Field and sit in sections with a reduced risk of exposure to peanuts. Information about the games, the precautions we take and a special ticket offer is all available at Mariners.com/NoPeanuts. While developed as a way to check for nutritional information of restaurant chains, it also includes ingredient lists whenever possible… Making that last minute rest stop a lot easier to navigate. Available (free) for iPhone and Android platforms. So, you’ve spent all day at the beach or on a hike and your gang is exhausted. Sounds like you’re eating at the rental house tonight! Do you need a dairy-free, nut-free, egg-free dessert? Try checking out Yummly. What I love about this site is that you can search for recipes WITHOUT certain ingredients. Who doesn’t want to make this amazing recipe?! 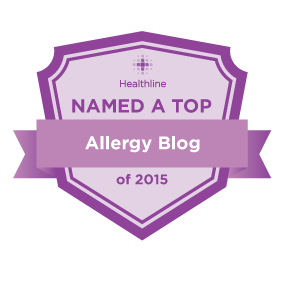 Traveling abroad with a food allergy can be tricky? You will want to make absolutely sure that your waiter and chef know you know a food allergy. Allergy FT translates your food allergy from English into Spanish, French or German allowing you to communicate in roughly 57 countries! Best of all, no internet connection is involved so no soaring internet rates! The American Red Cross app may be useful for any number of reasons. But for us, it’s symptoms and advice on anaphylaxis is particularly helpful. FindER will use your phone’s GPS to locate the closest ER to wherever you are. While I hope none of us ever has to use this, it’s good to know it’s available. I’d love to hear of any other apps people are using and finding helpful! And, of course, safe travels wherever your plans may take you! …or the pool, park or zoo…Don’t forget to bring your epinephrine. But, it’s important to note that epinephrine needs to be stored at room temperature (at around 77 degrees F). Therefore, consider toting your EpiPens or Auvi-Q around in an insulated lunchbox. In order to keep the epinephrine from getting too cold I sandwich a couple of juice boxes or a bottle of water in between my EpiPens and a freezer pack. You can use any old insulated lunch bag or tote or you could buy one that’s designed specifically as epinephrine storage. 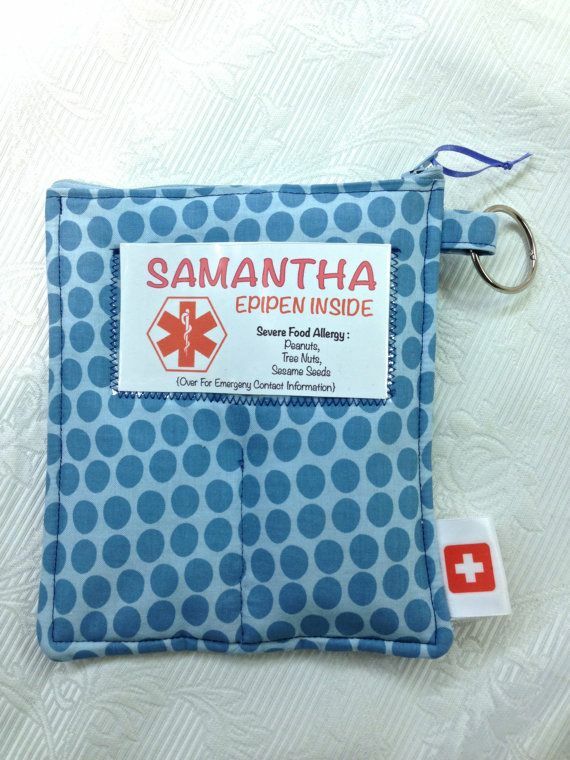 Look at this adorable insulated, customizable EpiPen pouch that I found on Etsy! Want one! **And, try to remember not to leave EpiPens in a hot car! Hope everyone’s having a great summer! It’s that time of year and not a moment too soon: Spring Break is upon us! Whether you’re traveling near or far, there are a few things you should do to make sure your spring break is exciting and safe. 1. Sometimes it’s the museum closest to you that’s the hardest to visit. If you’re heading to a museum, theme park, theater or zoo, you may wish to do some prep work. These venues often have limited nutritional options, waitstaff often cannot track down ingredients in their high-paced and sometimes chaotic environment and the safety of their menu cannot be guaranteed. Compound that with a picky eater and you could have a fun-ruining meltdown on your hands. 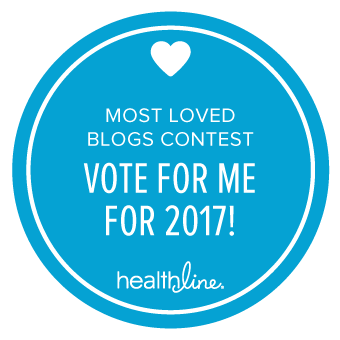 So, before you go, stick one or two of your child’s favorite dry snack in your bag along with those EpiPens – just in case. 2. Ditto for outdoor markets. Unless you’re going to a farmers market or pick-your-own farm, it’s often impossible to rely on the cart or truck vendors to know a full ingredient list and/or guarantee that their food is safely prepared without cross contamination. So, again, plan on eating just before your visit to that flea market and, again, bring treats for the kids. 3. If you’re taking your kids to a new section of town, you’ll want to scope out an eatery nearby that is likely to be safe. Regardless of whether or not you intend to have a meal while out, it’s always a good idea to be prepared for more fun (or random bouts of hunger). Check out the options online (including menus) and make a phone call or two to ensure that something can be safely prepared just in case a meltdown occurs. 4. Some of the fun of staycationing is mixing up your routine! So, try having some dairy-free sorbet for breakfast (see a list of local places right here at Allergy Shmallergy). Have a gluten-free picnic in the park. Eat that nut-free dinner under a tent in the family room. Fun and safety can go together very simply and easily! 1. Be sure to pack your emergency on-the-go pack in your carry-on. EpiPens are perfectly acceptable going through security. And, be sure to include baby wipes to wipe down tray tables and arm rests on airplanes that serve nuts, if you are allergic. 2. Again, pack snacks. You can buy a drink at the airport but safe meals are more difficult to come by. Not only is it sometimes a challenge to find FA safe meals at the airport, but getting information to ensure that they don’t contain allergens and are, in fact, safely prepared can be next to impossible. Snacks will tide you over until you reach your destination. 3. Airline meals and snacks may not be safe. Call the airline and ask them about their allergen policy. For FA kids, it might be easier to feed them at the airport or bring a bagel or sandwich in addition to snacks onboard for long flights. 4. If you’re traveling abroad, do a little research about how food is typically prepared. In parts of Asia, soy sauce (which contains not only soy but also wheat) is commonly added to dishes. In the Middle East, sesame seeds are quite popular. 5. Talk to the hotel concierge to find any specialty items you may need. 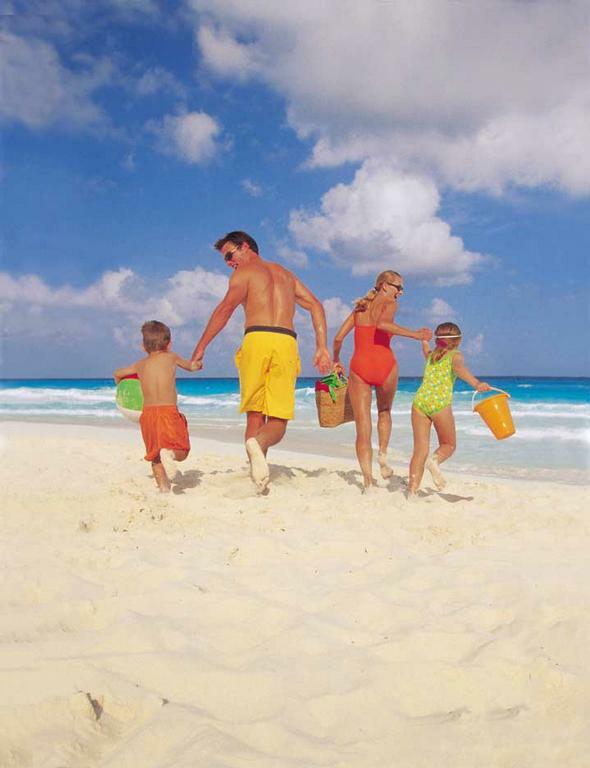 For us, we contacted our hotel to find out where we could purchase soy milk for my young son while in the Caribbean. While on the phone with the hotel, ask them to clear the minibar fridge so you can keep any specialty items fresh. 6. Again, if you’re vacationing somewhere where the don’t speak your native language, you’ll want to feel confident that the waitstaff understands your food restrictions. 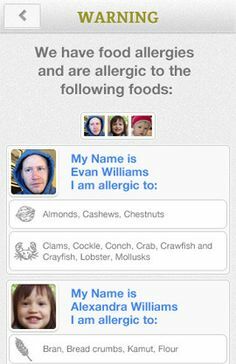 Try ordering some food allergy translation cards. These cards, made by a number of wonderful companies, help you communicate your family’s food allergy (and other dietary) restrictions in a foreign language. Encourage waitstaff to take the cards back into the kitchen so that chefs themselves can understand the parameters and make appropriate adjustments. 7. Finally, arrive prepared. When going abroad, our research indicated it might be tough to easily find a whole allergy-free breakfast for my FA son. While we could order fruit, everything else offered at the resort seemed to conflict with his allergies. So, we packed a bag filled with convenient breakfast food like small cereal boxes, raisins, and oatmeal. He could have a head start to breakfast in our room while we got ready and snack on fruit, etc at the restaurant table. Plus, we could use the empty bag to haul our souvenirs home. A win-win! The key to a successful spring break is relaxation. So no matter what form that takes, use the above steps to ensure that a food allergic reaction doesn’t hamper your fun. As my loyal readers already know, I have a little weakness for ice cream. Just a little (read: if it doesn’t involve ice cream, it probably isn’t really dessert in my world)…. On our most recent visit to Long Beach Island in New Jersey, we finally found the time to visit the renowned Show Place Ice Cream Parlor, where the talented singing wait staff find a way to get you into the act while serving giNORmous sundaes. Of course, our ticket to entry depends entirely on whether or not they serve sorbet. Thankfully, they list two on the menu (that’s two more than most places), although I discovered they only had one flavor upon arrival. Bummer. But on the plus side, Show Place does segregate the food allergy-related orders from the regular orders in another part of the kitchen. Furthermore, I was told they will scoop a food allergy-related order directly from a new container and add toppings (such as sprinkles) from their original cartons to eliminate the possibility of cross-contamination. Although I was disappointed with the flavor selection, my son ensured me that his orange sorbet was fabulous and ate every drop to prove it. I was happy with the procedure Show Place had in place for their food allergic patrons. And, the show was so entertaining! There’s no place like it, so if you find yourself on or near LBI, you really have to experience it firsthand.